Winter has been a bit of a wild card this year. The temperature has been everything but consistent with warming periods followed quickly by cooling periods. The warmth has made it impossible for significant ice cover to stay around for long. This can be seen all over the state, on our shores and below our waterfalls. This has upset many photographers, but it also provides possibilities that otherwise would be impossible. Ice has had a hard time gaining any ground so far. Many waterfalls are still flowing when normally they would be covered by ice. 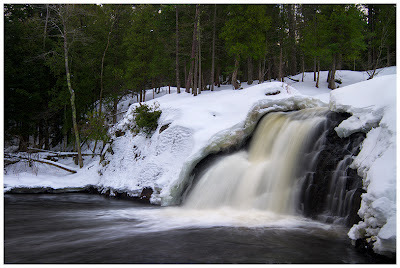 Providing interesting opportunities to photograph a flowing waterfall in mid-winter still surrounded by snow. This winter has been filled with warm days, but the nights are often still quite cold. Combine a rare cool day with a clear sky at night and the fast build up of ice begins. 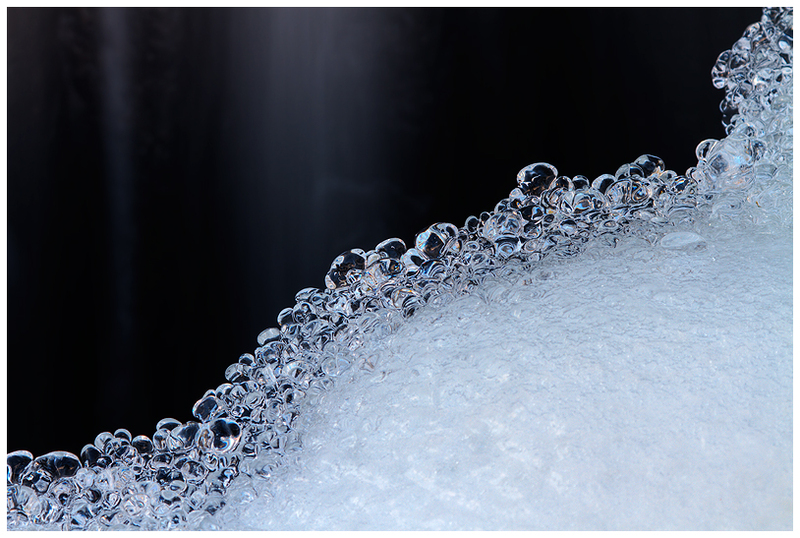 The photograph below features small rounded ice formations that were found at the mouth of a smaller waterfall on Dead River. The waterfall behind provided plenty of light water spray. During a cold night, the ice builts up in clear interesting shapes. The waterfall in the backdrop helps tell the story of how the ice formed and why it looks the way it does. Above: Canon 7D, Canon 10-22mm lens (@22mm), 3-stop neutral density filter, ISO 100, F/11, !/2 second. 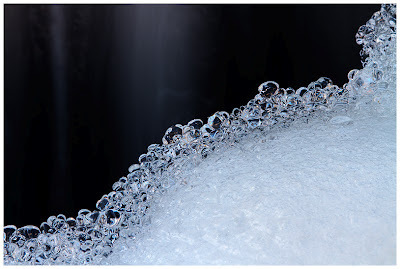 Below: Canon 7D, Canon 24-105 L lens (@105mm), 3-stop neutral density filter, ISO 100, F/8, 2.5 seconds.